Snowed in for winter. Keep your dog on a leash or under control. Yield to hikers! Slow down at intersections. Make sure your brakes are adjusted - especially disk brakes as you'll be using them!! Set up a shuttle or use the SAM (Sandy Area Metro) from Gresham and then catch the Mt. Hood Express up to Timberline - both buses have bike racks. You can continue on Crosstown and Maggie's Trail to Government Camp, or continue onto Pioneer Bridle another 8 miles down to the town of Rhododendron. Alternatively, you can stage a car at the Timberline Ski area sno-park and another at one of the many Government Camp Trail System Trailheads (see map). While you can ride up Timberline to Town, it is not recommended due to conflicts with downhill riders. We also discourage hiking on the trail. Bikers can ride up Westleg Road as an alternative to getting to the top of TL2T. Crosstown Trail can be busy, so slow down approaching the intersection and yield to pedestrians. There are no creek crossings on Timberline to Town, so you need to pack water for Fido! Ride or walk your bike through the parking lot of Timberline Lodge, past the swimming pool and amphitheater on your right, and the Magic Mile lift on your left. Start on the Mountaineer/Timberline to Town Trail on your left. Follow Mountaineer for about 1,500 feet past the pool until Timberline to Town breaks off on your left as you enter a ski run. From there, you'll pass through 4 consecutive ski runs and then head into the woods. There are some good photo ops with Mt. Hood in the background in the ski runs. About 1.3 miles in, you cross back to the east side of the old Glade Ski Trail. As you go lower, there are some tighter corkscrew turns and vestiges of the old Blossom Ski Trail as well as the corridor that had a ski lift mounted city bus used as a gondola between Government Camp and Timberline from the 1950's to 1962. The trail should be distinguishable from these other routes. If you were worried about your brakes, there are occasional grade reversals to give them a break. Just as you cross the old Glade Trail opening, you reach the intersection with Crosstown Trail. At this point, you need to slow down as there is hiker/biker congestion and less visibility of Crosstown riders coming from the east here. You can continue across Crosstown Trail a short way on the old Glade Trail and that puts you out on East Blossom Trail Way Road which can be followed into downtown. Please do not park or stage cars at the end of this road as there is not trailhead parking and the local residents on that road will become upset. Want to keep riding? Take a right (head west) on Crosstown Trail #755 and continue onto Pioneer Bridle Trail #795 to the village of Rhododendron. See Timberline to Rhododendron featured ride. Timberline to Town, originally constructed in 2012, has been a great secret, but word is leaking out. Many of the Sandy Ridge riders are finding this trail as much fun and longer. The Government Camp Trails were funded by a partnership between Zigzag Ranger District of the Mt. Hood National Forest, Clackamas County Business and Economic Development, trail crews from Americorps, equipment operators from On Call Construction and David Linn Trucking. All of the trails with the exception of Timberline to Town are designed as nordic ski and snowshoe trails in winter and hike/mt bike trails in summer. Timberline to Town may one day be signed as a snowshoe route. A bit dry and loose, but the berms are in amazing shape considering how late in the year it is. 20 minutes of pedal-free flow. So good. Carving up one of the many nicely banked berms. 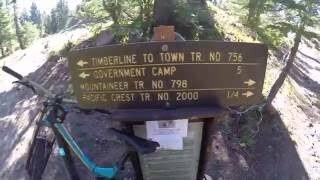 Shredding the Timberline to Town Trail.